Madam Irma Pince (fl. 1974 - 1997) was a witch and the librarian at the Library of Hogwarts School of Witchcraft and Wizardry. As all Hogwarts staff were highly skilled and professional, Madam Pince was no exception as she was highly possessive and protective of the Hogwarts Library's valuable books. She was a severe and strict woman, and was deemed highly unpleasant by most of the student body. After the death of Albus Dumbledore, she attended his funeral and wore a long black veil as a mark of respect. Irma Pince was born a witch sometime in or prior to 1974 and presumably purchased her wand prior to attending school. She likely attended Hogwarts School of Witchcraft and Wizardry and proceeded with her studies into the magic arts until at least her sixth year, since she could perform intricate non-verbal magic, was able to place powerful jinxes and hexes on objects and could effectively remove a curse from a student by administering the correct counter-curse. At some point, Pince took up the position of Librarian at Hogwarts School of Witchcraft and Wizardry. She was greatly disliked by the students for being very strict and unhelpful in finding books for them. An example of her strictness was the fact that she would not allow food in the library, for fear that the books would be damaged, and also disallowed talking, laughing, whispering, sneezing, scurrying, or any other behaviour that might seem at all suspicious in any way. She was also known to place odd jinxes and hexes on library books for their protection; for instance, one copy of Theories of Transubstantial Transfiguration, on top of the usual library book spells, was jinxed to hit the reader around the head, should he ever doodle on it. Pince cleaned the dust on the shelves of the library manually, with a feather duster she brandished at students whenever they looked suspicious. At some point, the Headmaster, Albus Dumbledore, visited the library with the goal of publishing Quidditch Through the Ages for Muggles to raise money. However, Madam Pince was extremely reluctant to let the book leave the confines of the library, as well as the wizarding world, and Dumbledore had to pry each of her fingers from the spine to take it. Once he had taken the book, she wrote a warning, threatening the readers that the consequences of mistreating the book would be as horrible as it was in her power to make them. Madam Pince: "What are you looking for, boy?" Madam Pince: "You'd better get out, then. Go on – out!" Madam Pince was still librarian by the time Harry Potter had arrived at the school. As Harry, along with his friends Ronald Weasley and Hermione Granger, searched the library for a book on Nicolas Flamel, Pince was deemed an obstacle, as she could warn Snape of their activities. Once, in December 1991, she saw Harry edging towards the Restricted Section of the Library and asked him what he was looking for. When he answered "nothing" for fear of her suspicion, she sent him out. On the next school year, Madam Pince was among the crowd who, on 31 October, 1992, read the Heir of Slytherin's message on the second-floor corridor of the Castle. A while later, Madam Pince overlooked the students at Study Hall, and was seen talking to a female student.It is unknown if this was a regular event that she chaperoned, or if it was a one-time event. Later, Hermione Granger arrived at the library with a note written by the new Defence Against the Dark Arts teacher allowing her to attain Moste Potente Potions from the Restricted Section. She gave it to Madam Pince, albeit reluctantly, wanting to keep Lockhart's autograph, and Pince did a very long observation of the note, checking for forgery. She then went into the Restricted Section and handed over the book, despite still being very suspicious. Pince attended the Gryffindor versus Slytherin match. She was shocked to see that Draco Malfoy was hurt. Madam Pince attended the End-of-Term Feast at the end of the school year, in which she sat by the Potions master, Severus Snape. She celebrated the downfall of Salazar Slytherin's Basilisk and the departure of the less-than-liked Gilderoy Lockhart. During the next school year, Madam Pince kept her usual routine of prowling around the library, breathing down the necks of those touching the books. Early in 1995, Dolores Umbridge was made High Inquisitor of Hogwarts. During the Easter holidays, she was seen stamping out a pile of books for a frantic-looking Hannah Abbott, who was presumably revising for her O.W.L.s. That day, she found Ginny Weasley and Harry Potter with chocolate in the library, and bewitched their belongings to chase them out. Madam Pince: "The library is now closed. Mind that you return anything you have borrowed to the correct - what have you been doing to that book, you depraved boy?'" Harry Potter: "It isn't the library's, it's mine!" Madam Pince: "Despoiled! Desecrated! Befouled!" Harry Potter: "It's just a book that's been written on!" Madam Pince remained at the library for the next school year, prowling around the bookshelves and protecting her tomes. At eight o'clock in the evening one day, Pince closed the library and told all of the students in there to return the books back to their shelves and to leave. When she told Harry and Hermione to leave, she noticed the Half-Blood Prince's highly graffitied copy of Advanced Potion-Making. Enraged, she screamed about how the book was "despoiled" and "befouled", and looked as if she may have had a seizure. After the death of Albus Dumbledore, Madam Pince was seen prior to the funeral in the Entrance Hall, standing by Argus Filch and wearing a thick black veil that fell to her knees. It is likely she attended the funeral. One of Madam Pince's most striking physical attributes was looking like an underfed vulture. Her skin was parchment-like, her cheeks were sunken, her face was shrivelled and she had an unflattering hooked-nose. She was also very thin and irritable-looking. Pince was a short-tempered woman who was overly protective of the Library's books and, as such, quite unpopular among students. She was mainly seen by students as an obstacle to research, but she was professional nonetheless, helping students to check out books. Her protective nature of books do not just apply to the library's, as she looked deranged when she saw Harry's own textbook covered with self-written notes. Likewise, she would not permit students eating in the library, and chased out anyone who violate this rule. It was commonly believed by Hogwarts students - including Ginny Weasley - that Madam Pince had a romantic attraction or even relationship with the caretaker of Hogwarts Castle, Argus Filch. Before Professor Dumbledore's funeral by the Great Lake, Pince was seen in a long veil standing by Mr. Filch. This did not go unnoticed by Harry. Librarian skills: As a librarian, Madam Pince was able to easily locate various pieces of information for students, as Harry was sure that she would be able to find Nicolas Flamel in a second, but thought it might be too suspicious to ask her about it. Jinxing and hexing: Madam Pince was skilled with jinxing and hexing books with nasty spells to make sure they were not mistreated. She also jinxed Harry's belongings to chase him and Ginny out of the library. Curses and counter-curses: Madam Pince was able to lift the Curse of the Bogies with ease. Non-verbal magic: Madam Pince was also adept in casting intricate non-verbal magic with her wand. One example was when she saw Harry and Ginny with chocolate in the library. She jinxed their possessions to chase them out. Loquaciousness: Pince was very loquacious and voluble in her speech. She was also fluent in Latin. "I would like to apologise for you and any other librarians present here today and my get-out clause is always if they'd had a pleasant, helpful librarian, half my plots would be gone. 'Cause the answer invariably is in a book but Hermione has to go and find it. If they'd had a good librarian, that would have been that problem solved. So ... sorry." Irma could be a play on firma, which can mean both solid and frail. This makes her name mean something along the lines of "a frail woman with a pinched nose", or one who has a "firm pinch". Irma could also mean "the strong" or "she who is protected by Irm" (Irm is a Germanic god). Irma is from German irmen for "whole" or "complete". The last name Pince seems to be in reference to the French word, which means "to pinch". The style of folding eyeglass, pince-nez, literally means "to pinch the nose". Pince is portrayed by British actress Sally Mortemore in the film adaptation of Harry Potter and the Chamber of Secrets. In the film, she appears briefly; sitting next to Severus Snape during the End-of-Term Feast and can be seen in the background of several other scenes. 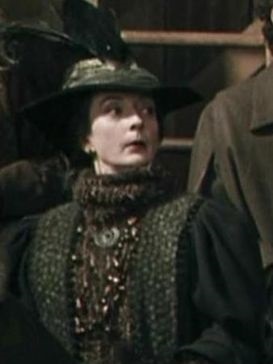 For various reasons, such as that Pince has a hooked nose and dark hair like Severus, that her name is an anagram for "I am Prince", and that she is a rude and somewhat snappy personality like Snape, it is rumoured that Irma Pince is actually Eileen Prince in hiding, though this has not been confirmed. In the video game adaptation of Harry Potter and the Philosopher's Stone, Madam Pince is seen awarding house points. She never does so in the books. In the video game adaptation of Harry Potter and the Chamber of Secrets, Madam Pince appears to have red hair, rather than black. Despite the fact she appears to be old in the books and videogames, Sally Mortemore was 41 at the time of filming, and no effort was made to make her character appear older. The Game Boy Color versions of the video games depict Pince as a helpful old woman with very thick glasses. ↑ If Pince was in a relationship with Filch, as was suspected by some students and suggested in The White Tomb chapter of Harry Potter and the Deathly Hallows, then it would be highly unlikely that she was married. ↑ Harry Potter and the Chamber of Secrets (film). This page was last edited on 11 July 2015, at 15:56. This text is available under the GNU FDL and may have been adapted from the Wikipedia article about Irma Pince (history).